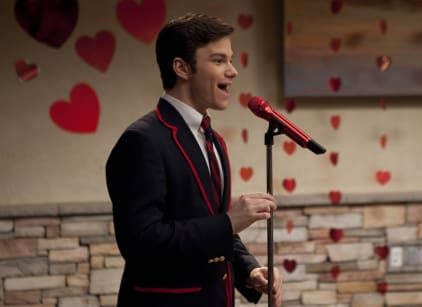 On a Valentine-s Day-themed episode, Finn sets up a kissing booth to supposedly raise money for the glee club. But it's really to kiss Quinn again. When this finally happens, both halve of the former couple sees fireworks. As a result - behind a suspicious Sam's back - Quinn asks Finn to meet her the next day in the auditorium. He does. They make out some more, but Quinn makes it clear she doesn't know who she wants to be with. Santana, meanwhile, angry over the club making fun of her, realizes what is going on, contracts mono herself, gives it to Finn, who gives it to Quinn and their secret is out. Rachel ends up asking Finn what it was like to kiss her versus kiss Quinn and disappointed by his answer. Yet also hopeful: maybe she can move on now. - Puck really crushes on Lauren, who is intent on making him work to date her. - Blaine serenades someone other than Kurt, and is then told by our favorite gay singer that he was hoping to be the object of Blaine's affections. Blaine apologizes, says he's very bad at dating/love and the two agree to remain friends. For now.